The day you bring home a puppy has to be one of the most exciting days hands down. Whether you’ve been planning for months for the day you bring your puppy home, or you decided that day to stop by the nearest rescue and pick up a pup, there’s no greater feeling. On the way there, all you can think of is how you are going to hold them, pet them, and play with their tiny little paws. However, nothing could’ve prepared me for the moment I finally had my puppy in my arms. 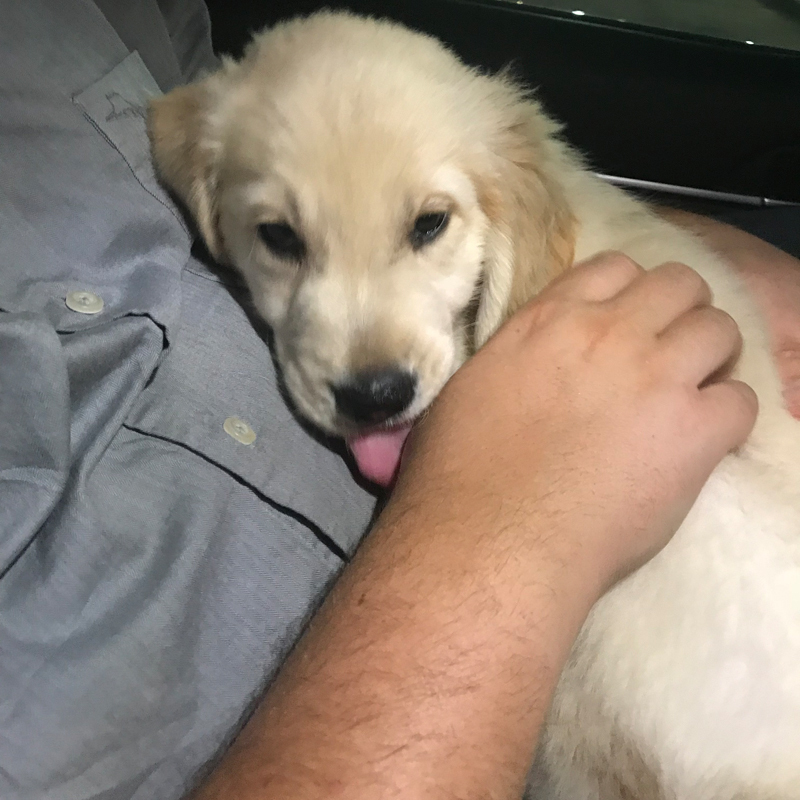 On Friday, May 25th, I picked up my little guy, Leo, and my life changed forever. I was one of the ones who planned months ahead of time. I read what seemed like millions of “how to” articles and then read them again…and again. 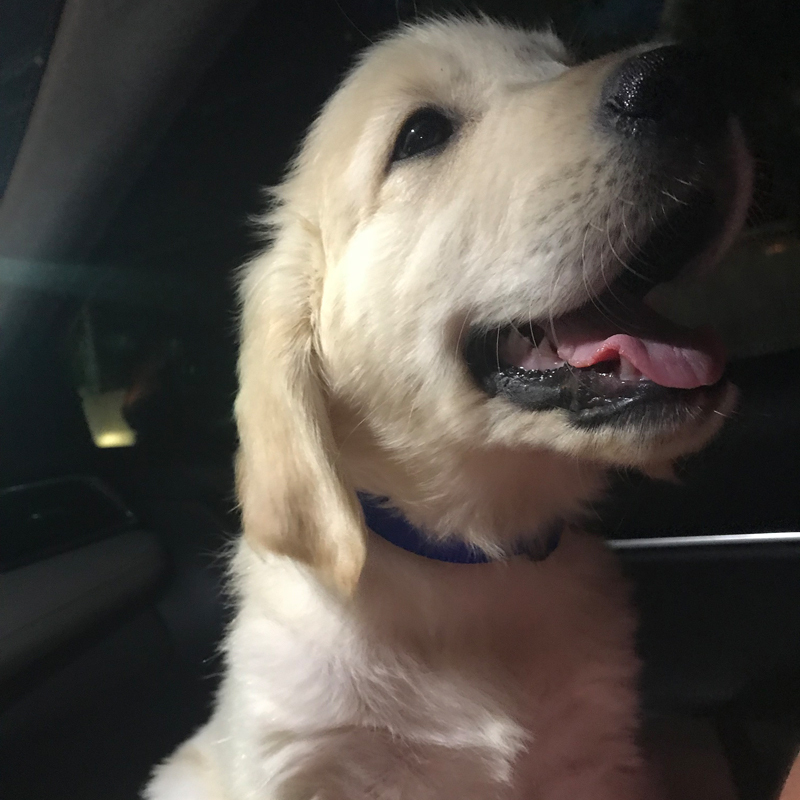 Did I mention that Leo is my first puppy ever, and I have absolutely no idea what I’m doing? For the ride home, I was prepared for anything. My other half, Erich, was going to drive, and I was on Puppy Duty. Whether it was puking, crying, jumping, I was ready for it. Luckily enough, the whole ride home Leo was calm, composed, and even dozed off a few times. Not once did he cry or try to get out of my arms and into the driver’s seat. The first night was great, up until we introduced Leo to crate training. Hint: the three of us did not sleep very well the first night. Our puppy parenting journey is going to be a great one, and I can’t wait to share every bit of it. 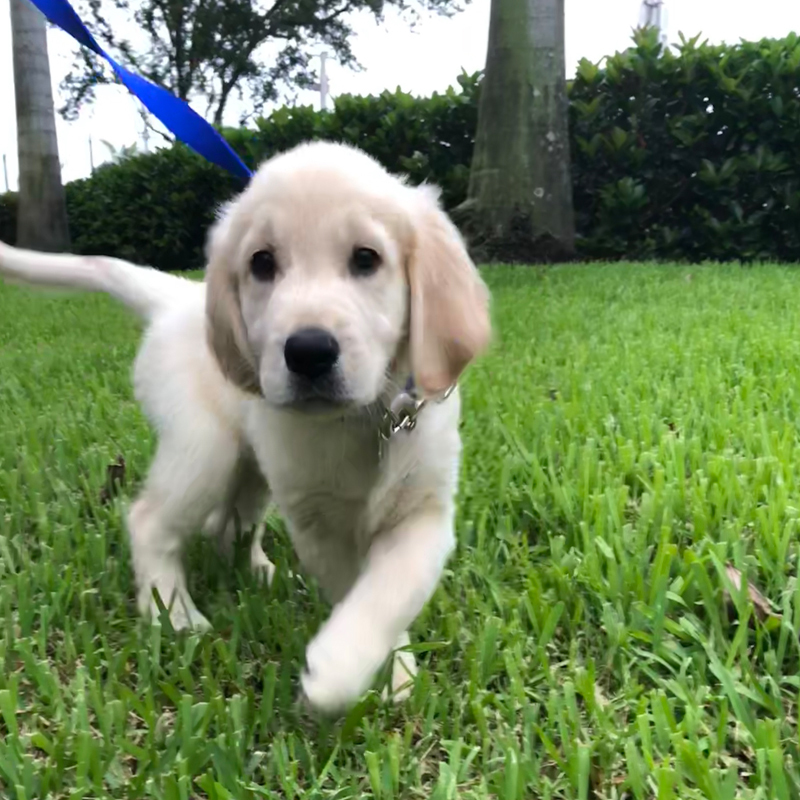 If you have any tips for the first night, week, or month with Leo, please let me know in the comments below! Can’t wait to follow along with you and Leo! We’ve had lots of babies and never had any problems with potty training. We arrange alarm for every 2 hours and baby goes out and doesn’t come in until he does his business. And we praise praise praise. Also after eating and drinking same thing. It’s never taken us more than 2 days and no messes in the house. Even our 2 that live outside in a big kennel-same routine and same results. Good luck and good love!!! For the first few weeks, I put the crate right next to our bed so he would be nearby and could still smell our scent. (Actually slept with my foot hanging off the side of the bed for a few nights.). I also give a treat whenever he goes into the crate so it is a positive experience. He runs in on his own now! Never use the crate for punishment if you want him to go in willingly. Get a toy from the breeder with the smell of the puppy’s siblings. Also a soft toy that has a ticking mechanism help to almost hypnotize him. I always cave in and just let the dog sleep with me. Put an item(shirt,towel that has your scent on it) in the crate with him. Give him a treat and praise him after he gets in the crate, then close the crate door. Good luck and happy puppyhood. I’m a Certified Dog Trainer.. Get him on a house breaking schedule. Get him socialized when he’s had all his vaccines. PetSmart and Petco are good places to take him for that. Work on manners, boundaries and basic training. Play time is a must. A tired puppy is a less destructive puppy. Enjoy your new puppy! Uhhh, how about pets need a bed at night… yours. Congratulations on your new furbaby! I’ve share my life with dogs for 32 years and there’s nothing like the love and devotion of a dog. I think my best suggestion would be to establish a daily routine and consistency. It helps them know what to expect and I think helps them to be calm and he’ll learn when it’s time to eat, when you come home from work, when there are walks (important part of house training), playtime, bedtime, etc. It’s difficult for a puppy to acclimate from living with litter mates to being the only dog with strangers so slow training with a routine usually helps to calm them and it also helps in avoiding separation anxiety. Besides my own dogs I’ve fostered many dogs over the years that have separation issues as well as fear aggression and it’s important to also make sure he is well socialized so he’ll be comfortable with others besides his family. I’ve always crate-trained dogs; it gives them their own space and eventually many times I leave the door open so the dog has somewhere to go when it wants its own space. Besides lining the crate with a soft blanket I also place a stuffed animal in the crate for it to cuddle with and I roll the blanket edges to make it more comfortable. Finally, since it’s your first dog I’d suggest professional training to help you learn training. As an example I know a certified trainer who has progressive classes that address how to do positive reinforcement training as the dog grows up; each class lasts a few weeks. The first is called Puppy Kindergarten that is puppy socialization and the classes progress from basic obedience, advanced obedience, impulse control, and learning fun tricks to play together. I also like that the trainer has very small classes; only 3-4 owners so she can work with each person and pet during the class without paying for private lessons although she also has private lessons if the owner wants them. You may find these types of lessons helpful since this is your first dog. Most importantly, enjoy the special love and companionship of a dog! What has worked for us is 1) having a dog door & 2) having an older dog who shows the younger one why/how to go through it. Training done literally in a day! I’ve crate trained several puppies and the end result is so great. At night after his last meal do the potty routine then have a quiet time for just a few minutes. As you put him in the crate always say “crate”, then shut the door and walk away. DO NOT go to him, no matter how much he cries, until it’s his potty time. Then do the routine all over again. In the daytime I make the crate a friendly place by putting his food in at feeding time, plus a toy or two. I DON’t leave food in the crate after he’s through eating. No food at night, maybe just something to chew on. Those little teeth need their exercise too. After a few days he knows what crate means and will go into it willingly with no complaints. Keep it a friendly place, never for punishment. When he’s older it will be his safe place.